I went to Fermanagh with my pet human this week. 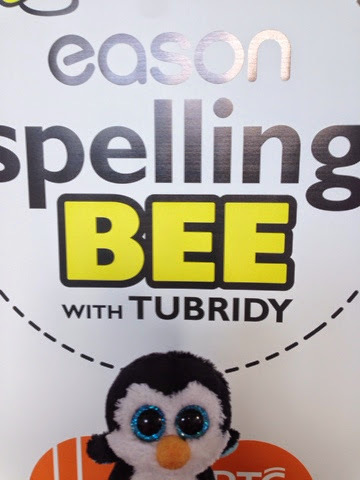 We went to the Eason Spelling Bee. 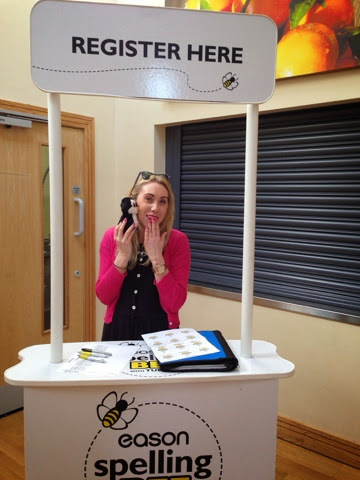 A Spelling Bee is a competition to find the best speller, we went to find the best speller in Fermanagh. Fermanagh is up in Northern Ireland and it took ages to get there in Helen's car. I slept a lot in the car because it was really boring. When we got to the school where the Spelling Bee was on I registered as a speller. I signed up as Waddles P Penguin and Elizabeth asked what the P stands for...But I don't tell anyone that because it's a secret and a little embarrassing. But I did like Elizabeth and I gave her a little kiss. 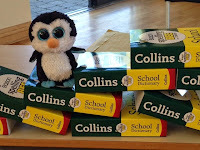 When I had registered to spell I was told to go sit down, I sat on the dictionaries. Elizabeth and Helen laughed and said they meant I could sit on the chairs but I thought the dictionary was more comfortable. A dictionary is a funny book where all the words live, some words are really hard and some of them I knew already. A dictionary tells you what the words means and how to spell them. When all the other spellers arrived we went to sit on the benches so the Bee Master and Adjudicator could listen to us spell super hard words. 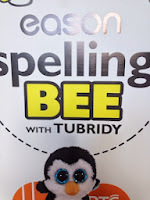 The Bee Master calls out the words and the spellers spell them. I had to stand up on the bench so the audience could see me. Then the Bee Master gave me my word, I said the word, spelt the word and said the word again. Some of them were really hard and some of them I thought were a little easy. I spelt Queen and forget correctly and thought they were easy. Then the hard rounds started. I didn't spell cormorant correctly so I was out then. I was a little bit sad but it was still super fun to watch the rest of the spellers and see who won. 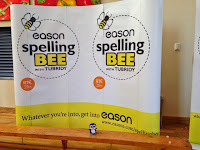 A lovely small human called Andrew won the Fermanagh Spelling Bee. There was guy from the radio there too, he was asking all the small humans questions about the Spelling Bee. Then yesterday it was the Radio with Ryan Tubridy, if you missed it you can listen to a podcast here. It was a little scary talking on the radio but it was still fun and all the small humans seemed to enjoy it too. 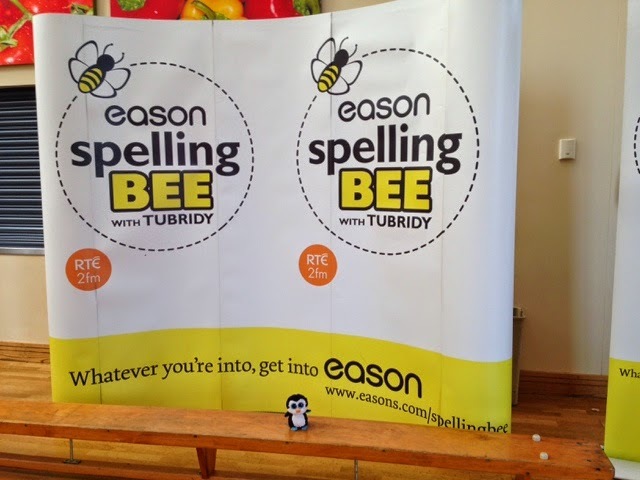 There's no more county final Spelling Bees now but the finals are coming up too! At the end of June the finals will be on, I hope I get to go watch them! But even if I can't go I can listen to it on the radio on Ryan Tubridys show. I think all the spellers are amazing and can't wait to wish the finalists the best of luck in June.